I just sold my good old Ibanez Soundgear SR500. It has been a trusty companion for a few years and its sound has traveled with me long miles. 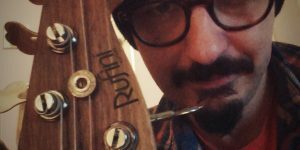 Then Matteo Rufini started building great instruments for me and I used it less and less; I am very sad to see it go but instruments are made to be played, not to gather dust on a guitar rack. I bought that instrument at Sam Ash in NYC in 2010 and it’s the bass I gigged with Stateside. I used it on Will Duvall‘s Nightbirds and in bits of The Rube Goldberg Machine‘s Fragile Times. It came with me on a long European tour with The Wishing Well and I have great memories of hitting the stage with this beautiful guitar. It never failed me once and always delivered great tone. As a tribute to my old friend, I’m posting a song from The Wishing Well’s youtube page. n the past few weeks I happened to have a similar conversation with different musician friends.